Henry Joseph Henshaw1,2,3,4,5,6 [Joseph Henshaw7,8]. Born Apr 9 18522 [18501,6,8], New York2. 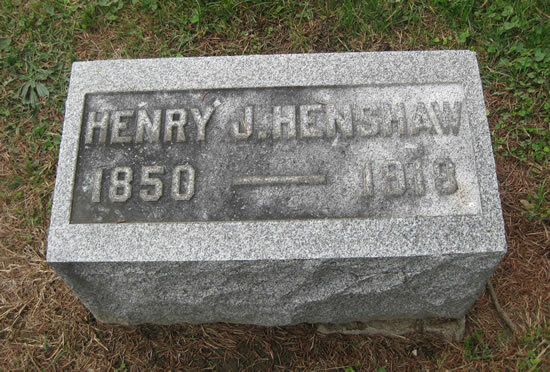 Henshaw, Henry, age 28, born in New York; parents born in New York; carpenter. Henshaw, Mary, wife, age 21, born in Ohio; parents born in Ohio; keeping house. Henshaw, Carrie G., daughter, age 3, born in Ohio; father born in New York; mother born in Ohio. 1880 census, Gallipolis, Gallia County, Ohio; roll T9-1018, ED 23, page 291C.